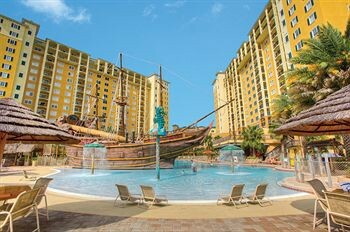 LocationThe resort is conveniently located just inside Lake Buena Vista, just off International Drive and the SR535 and close to the fabulous Lake Buena Vista Factory Stores. It is only minutes from the theme parks of Walt Disney World and Downtown Disney in one direction and Universal Studios, SeaWorld and Wet 'n Wild in the other, making this the most central and convenient area to be when staying in the famous, fun-filled destination of Orlando, Florida.FacilitiesThe hotel comprises a main building and 4 adjacent buildings, offering a total of 500 rooms on 8 floors. Guests of the hotel are welcomed in the lobby, which has a 24-hour reception and a 24-hour check-out service. The upper floors are easily accessible using the lift. Amenities include a cloakroom and a safe. Internet access is available in public areas. Gastronomic options include a restaurant and a pub. Guests can visit the supermarket to purchase daily necessities. Guests can buy holiday mementos from the souvenir shop. Shopping facilities are available. Children can have fun playing in the garden. A playroom is also among the amenities at the hotel. Parking facilities available to guests include a garage and a car park. Additional services include room service, a laundry and a hairdressing salon. A shuttle service is offered.RoomsAll accommodation units feature air conditioning, central heating, a fan, a living room, a kitchen and a bathroom. Bathrooms with wheelchair access can also be booked. Most rooms additionally feature a balcony or a terrace. The carpeted accommodation units feature a double bed, a king-size bed or a sofa-bed. A safe is also available. A fridge, a cooker, a microwave, tea and coffee making equipment and a dishwasher contribute to a comfortable stay. In addition, there is a washing machine and an ironing set. Each accommodation unit offers internet access, a telephone, a TV, a radio, an alarm clock and wireless internet access. Wheelchair-accessible accommodation units are also bookable. Each of the bathrooms features a shower, a bathtub and a hairdryer.Sports/EntertainmentThe hotel offers an outdoor pool and a children's pool. A waterslide provides fun for all ages. Sun loungers provide a great place to sunbathe. The hot tub offers revitalisation. Various refreshing drinks are available from the poolside bar. Leisure options at the hotel also include a gym, a spa, a beauty salon and massage treatments. A wellness area with a solarium is available. Further available options include a kids' club. PaymentAll major credit cards, including American Express, VISA and MasterCard, are accepted for payment.